The current head of the Catholic church, Pope Benedict XVI, is rather fond of electric cars. We know this because back in 2010, the Vatican revealed that he was eager to count an electric vehicle among his throng of armored cars--presumably to go with the solar panels he's had installed on the roof of some Vatican buildings. 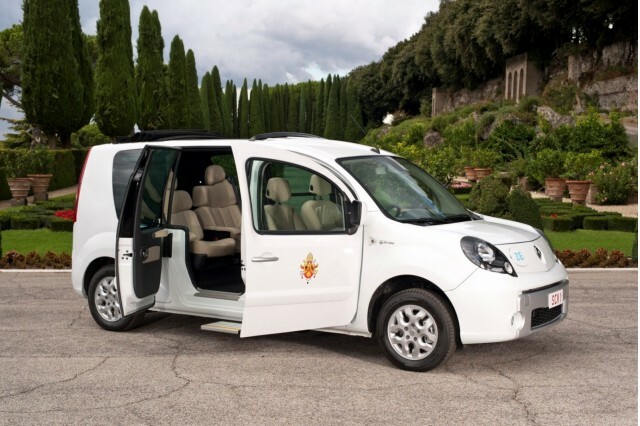 Now, French carmaker Renault has donated the Pope two new electric cars, both based on the Kangoo Maxi Z.E, an electric, glazed version of the Kangoo delivery van used throughout Europe. The first of the Pope's new vehicles is painted in a saintly shade of white, with the Papal coat of arms emblazoned across the doors. The car will be used when the Pope is traveling at his summer residence in Castel Gandolfo. The second will be used by the Corps of Gendarmerie Corps in Vatican City, the Pope's own personal police force, and is painted blue with a yellow and white stripe down the side. Each has 60 horsepower, and a range of just over 100 miles. While the regular Kangoo is equipped with a spacious rear bench, the Pope's cars use two individual rear seats, suitable for a Papal posterior. It also features an opening roof, and a retractable side-step to ease boarding and alighting. The cars, built in conjunction with French coachbuilder Gruau, were handed over to his Holiness by Renault Chairman and CEO Carlos Ghosn. Though not intended to replace the famous "Popemobile"--electric cars are deemed "too slow", given the huge amount of armor normally applied to his cars--the cars should help reduce the Vatican's energy needs just a little further.